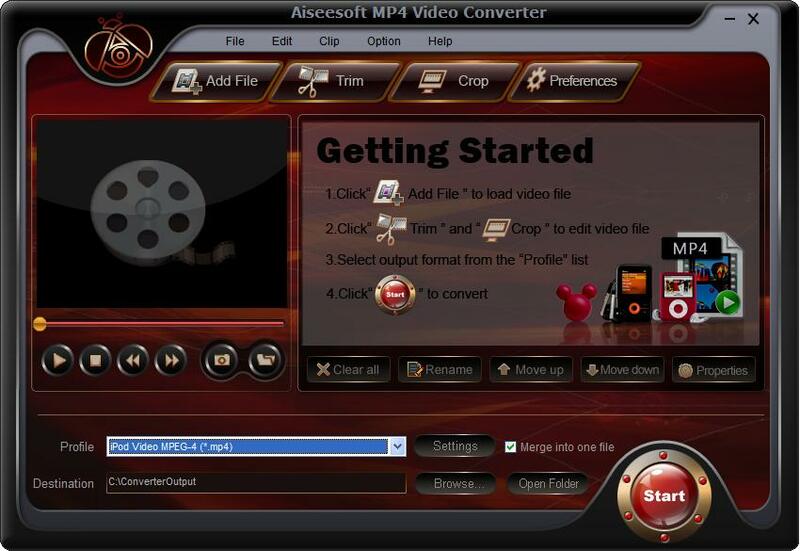 Aiseesoft MP4 Video Converter is the professional and best MP4 Video Converter software. It offers a powerful and easy way to convert all popular video and audio formats (including: MPG, MPEG, MPEG2, VOB, MP4, M4V, RM, RMVB, WMV, ASF, QT, TS, MKV, AVI, 3GP, FLV, MPV, MOD, TOD, MP3, MP2, AAC, AC3, WAV, MID, MIDI, WMA, M4A, RA, RAM, etc.) to mp4 formats, such as Convert AVI to MP4, MPEG to MP4 Converter, MP4 to AVI Converter and so on. ...... video formats supported, such as AVI, MPEG, WMV, MP4, DivX, MOV, 3GP, ASF, etc. Just select the videos you want to join and check the 'merge into one file' check box you can finish it easily. Aiseesoft MP4 Video Converter software provides 'Trim' function to help you cut a clip from the original video. You can set the 'Start Time' and 'End Time' of the clip you want to get or just drag the slide bar to the accurate position to achieve it. Aiseesoft MP4 Video Converter software allows you to remove black edge of your movie and get any playing area of the video by using its 'Crop' function. You can also select the 'Zoom' mode to extrude your video slightly to adjust to your portable devices so you can get the best video quality. A software for 3GP/MP4 file conversion of portable video device. A software for iPod MP4 file conversion of portable video device. Convert AVI to iPod, WMV to MP4, AVI to H.264 video, MP4 to PSP. Qweas is providing links to Aiseesoft MP4 Video Converter 6.2.36 as a courtesy, and makes no representations regarding Aiseesoft MP4 Video Converter or any other applications or any information related thereto. Any questions, complaints or claims regarding this application Aiseesoft MP4 Video Converter 6.2.36 must be directed to the appropriate software vendor. You may click the publisher link of Aiseesoft MP4 Video Converter on the top of this page to get more details about the vendor.